The development of the steam engine by Robert Stevenson led to many great feats of engineering during the Victorian period, including the development of iron bridges and ships, railways and the London underground system. Canals and sewers were also developed. Communication improved with the development of the telephone by Alexander Graham Bell (in 1876) and telegraph (in 1858). A cable was laid under the Atlantic so people could telegraph the United States in 1866 by Isambard Kingdom Brunel's iron steamship the Great Eastern. Sir Joseph Bazalgette designed and built the sewage system which provides London with proper drains. It was a huge task, and very expensive, and at first Parliament was unwilling to undertake the project. But when it was completed it was said that Bazalgette made as big an improvement in the appearance of London as Sir Christopher Wren had done before him, and had saved more lives than any other Victorian public official. Like his friend, Isambard Kingdom Brunel, Sir Joseph was born in England but of French descent. 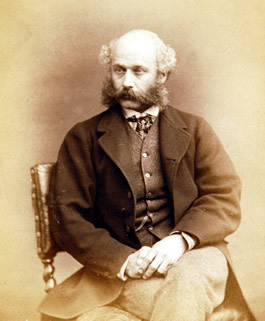 He trained to be an engineer and when The London Metropolitan Board of Works was set up in 1856 to co-ordinate public works throughout London, Sir Joseph Bazalgette was appointed as the chief engineer. In 1853-54 the deadly disease cholera killed 10,738 people in London. No-one knew that it was carried in the water, and most people thought that it was carried in the smells in bad air. something must be done about the smells which arose from the overflowing drains. It got so smelly and people were so scared of contracting cholera that Parliament had to be suspended. Laws were passed giving Sir Joseph Bazalgette power to divert many of the little rivers of London into deeper tunnels which took the water to sewage works to be treated and purified. Huge embankments were built along the Thames to house the sewers and the London underground system which was also being built at the same time. In 1866 cholera broke out again in London's East End, which was not attached to the system, and people started to accept the idea that it was a water-borne disease. After the sewers were built London was much cleaner and the cholera outbreaks stopped.